Like billions of Muslims around the globe, Ahmed Al-Mahdi, a 22-year-old student, is getting ready to welcome the holy fasting month of Ramadan. He has bought a new copy of the Noble Qur’an and a new set of cloths to wear for the tarawih prayers. “I want to turn a new page in my relations with Allah,” he told IslamOnline.net. It is customary for Muslims to spend part of the days during Ramadan studying the Noble Qur'an. “We all are readying to welcome Ramadan,” says an enthusiastic Zohor, a 36-year-old teacher. Many Moroccans started preparing for Ramadan, expected to start on August 22, by fasting days in Sha`aban. 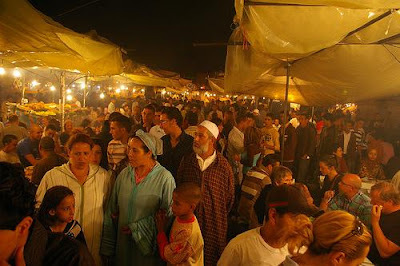 “Fasting duing Sha`aban has become a habit for many men and women in Morocco,” notes Zohor. Ali Mudan, a Justice Ministry employee, agrees. “Some of my friends have rearranged their vacations in order to spend more time worshipping in Sha`aban to prepare for Ramadan,” he told IOL. Prophet Muhammad (peace and blessings be upon him) used to fast during Sha`ban more than he did in any other month, expect Ramadan. “We love the Prophet and want to follow in his foot steps,” says Fatimah Deamash, an elder housewife. Ramadan preparations are not only faith-oriented. "I have cleaned up my house to be ready for Ramadan,” says Aisha Aroub, a civil servant. Haleyah Benasi, a housewife, is also making special preparations for the Ramadan kitchen. "I have bought many traditional food items to be served on our iftar banquests during Ramadan," she told IOL. Iftar banquests are a good chance for many friends and families to come together and renewed their relations. Mohammad Kamal, a young preacher, says all these different preparations speak of one fact.